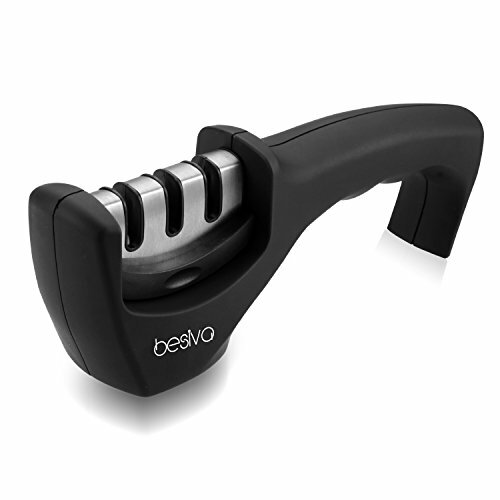 Besiva Knife Sharpener, 3-Stage Professional Ceramic Kitchen Tungsten Diamond for Ceramic and Steel Knives..
3 STAGE DESIGN-Slot 1 is for coarse that quickly sharpen dull or damaged knives with just a few pulls, slot 2 for fine that are ideal for finishing and polishing the edge.Slot 3 for ceramic knives and exact-grinding. SLIP-RESISTANT DESIGN- Solid ABS plastic body with slip-resistant rubber bottom mean your sharpener is easy to handle and stays in place during use. FAST- Simply draw the knife through each slot a few times to achieve a razor-sharp edge.